The Thrill-Seeker Challenge at Gold Reef City is not only great for your health, it could net you R50 000 in prize money. Think you need a day in the gym to get those calves screaming? 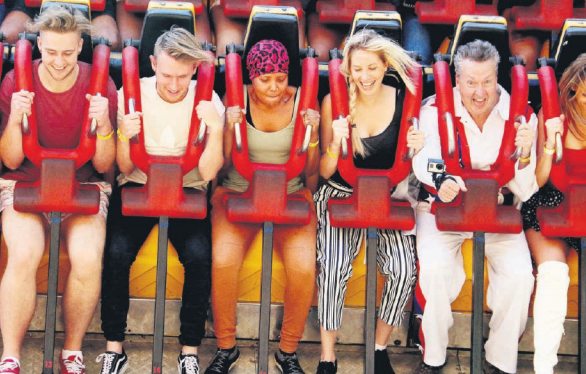 This summer season you can scream away 500 calories at Gold Reef City when you take on the Thrill-Seeker Challenge, a rowdy run through the park that clocks in 8 000 steps (approximately 6km of walking) and seven flights of stairs while riding the park’s wildest rides. This is the data my little Samsung Gear2 Fit Pro tracked while spending the morning at Gold Reef City taking part in the park’s third annual Thrill-Seeker Challenge. Thrill rider tickets are available until November 18 and come with a little yellow pamphlet featuring 10 of the theme park’s most notorious thrill rides; Tower of Terror, Anaconda, UFO, Miners Revenge, The High-flying Maverick, Golden Loop, 4D Theatre, Jozi Express, Dream Boat and Runaway Train. After each ride, ask the operator to stamp your card and voila – a completed entry. Hand this in on leaving and you could be one of 10 lucky entry forms drawn on November 18 to take The Ultimate Thrill-Seeker Challenge on November 25 in which the first person to cross the finish line will win R50 000 cash and the keys to Gold Reef City which include four Theme Park tickets per month for a year, four movie tickets per month for 12 months, four tenpin bowling tickets per month for a year, a R500 meal voucher for 12 months and a two-night stay at either the Southern Sun Gold Reef City or Gold Reef City Theme Park Hotel. But, your body is the ultimate winner. Data from my morning at Gold Reef City (10am to 2pm) only picked up 8 012 steps. A full day can easily see you reach over 10 000 steps when you factor in other rides. That’s not all. This month it was revealed that rollercoasters can also help you scream away kidney stones. On September 13, Marc Mitchell and David Wartinger received an Improbable Research (IR) Nobel prize for their work that concludes that riding a rollercoaster can hasten the passage of kidney stones. The LR Nobels is a spoof on the Nobel Awards in which out-of-the-box research wins awards for making people think differently. One award-winner this year measured the frequency, motivation and effects of shouting and cursing while driving. Another from Singapore investigated whether it is effective for employees to use Voodoo dolls to retaliate against abusive bosses. The big question is, how accurate is the data recorded by my smart watch at Gold Reef City? Well, very. Compared to data logged on an Apple watch on the same day, the differences were minor. Who would have known exercise can really be fun? 1. As you enter, head straight to Thunder Mountain at the top right area of the park, where you will find the Anaconda and Runaway Train. Start with the Anaconda, the rollercoaster’s exit passes the Runaway Train’s entrance. 2. After a mine tour on the Runaway Train, head to The Cove where you’ll find The Golden Loop, the highest rollercoaster in Africa. around the tin houses of the area. 4. After your cinematic ride, head straight to Lost Reef which is at the exit of the 4D theatre. Here you can tick off UFO, Miners Revenge, The High-Flying Maverick and Jozi Express. 5. Saving the best (and scariest) ride for last, go to Dizzy Heights for the fastest rollercoaster ride in Africa, Tower of Terror.